Mom Loves 2 Read: Santa Watch Starts at 6:00 AM tomorrow! Join the fun, Win some prizes! Santa Watch Starts at 6:00 AM tomorrow! Join the fun, Win some prizes! 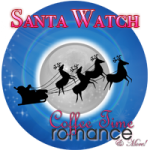 Do you want to WIN Books, Gift Cards and other Great Holiday Prizes I’m giving away one of those fun things during Santa Watch with Tarah Scott and T.C. Archer tomorrow – December 24th at Coffee Time Romance. There are a lot of authors and other bloggers participating this year with fun Santa Sightings, Holiday Memories, and LOTS of contests and prizes throughout the day! Stop by, leave a comment or hang out with us! We’re starting early – at 6 AM !! Check it out tomorrow and see all the fun prizes, as well as the $5 Amazon GC I'm giving away, plus enter to win many others! I hope to see you tomorrow!